LONDON -- Britain's Conservative Prime Minister Theresa May gambled in calling a national election, thinking she could cruise to a big win. She appeared early Friday morning looking shaken, chastened and beaten -- odd for somebody whose party won more seats than any other, perhaps, but as CBS News' Mark Phillips reports, the way British politics works, her party's narrow victory amounted to an effective defeat: She lost her majority in Parliament. Pressure mounted on her to resign, but she refused -- at least for now. Instead, May visited Queen Elizabeth II and informed her that she would seek to form a coalition government with a much smaller party from Northern Ireland. The stunning result throws British politics into chaos and could send Britain's negotiations to leave the European Union -- due to start June 19 -- into disarray. The British pound lost more than 2 cents against the dollar in initial trading as results became clear. Without a majority in Parliament, May's authority is greatly eroded and her Conservative Party will struggle to push through its vision of a "hard Brexit"; one that would see Britain unbound from the key tenets of the EU which require, among other things, a free flow of goods and people across state borders. May's vision of Brexit calls for tariffs on EU goods imported into Britain. With 649 of 650 seats in the House of Commons declared, the Conservatives had 318 to the Labour Party's 261. Even if the Conservatives win the remaining seat, a London district, it is impossible for them to achieve the 326 seats needed for an outright majority. Before the election, the Conservatives had 330 seats and Labour 229. In spite of the dramatic losses for the Conservatives, they remained the party with the most votes, and May made it clear she was not abandoning her post. She said she would form a coalition government with the Democratic Unionist Party of Northern Ireland. Cutting a deal with the DUP could allow May to remain in the Prime Minister's office, albeit with a far weaker mandate. She insisted, in a statement announcing the effort to form a coaltion with the DUP, that Brexit negotiations would begin as scheduled on June 19 as previously expected. Who will "win" Brexit: the U.K. or Europe? May vowed to form, "a government that can provide certainty and lead Britain forward at this critical time for our country. This government will guide the country through the crucial Brexit talks that begin in just 10 days and to deliver on the will of the British people by taking the United Kingdom out of the European Union." Guenther Oettinger, a German member of the European Commission, said earlier Friday that the election result had left it unclear whether negotiations between the U.K. and Europe on Britain's exit from the union could begin that soon. The EU was hoping for a stable British government to help ensure smooth divorce negotiations ahead of Britain's mandated departure in March 2019. "We need a government that can act," Oettinger told radio station Deutschlandfunk, according to the Reuters news agency. "With a weak negotiating partner, there's the danger than the negotiations will turn out badly for both sides... I expect more uncertainty now." Echoing Oettinger's skepticism about negotiating with what could essentially be a lame-duck government in London, Michel Barnier, the EU official tasked with leading the Brexit negotiations, said Friday that the talks should only begin "when the U.K. is ready." He added, however, that the overall two-year timetable for Brexit to be made official would not change, and that Europe's positions remained clear. 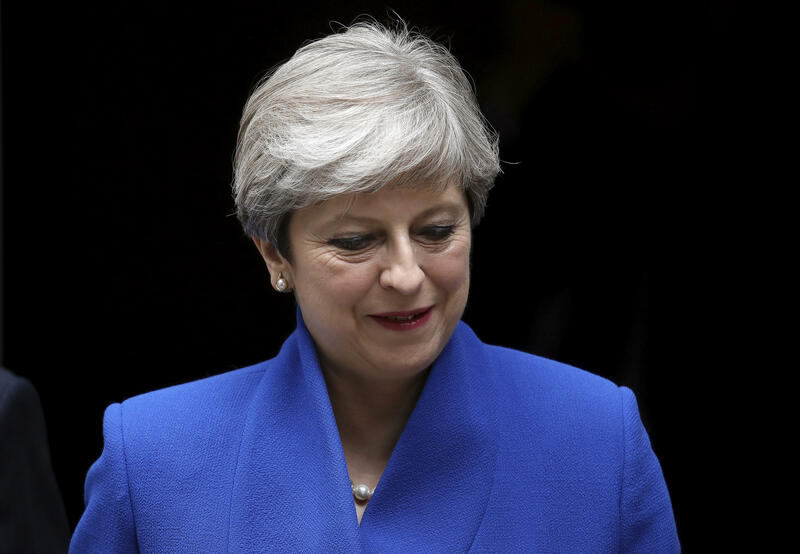 As CBS News' Phillips reports, May called this snap election while riding a double-digit opinion poll lead. She built her campaign around her leadership, which she called -- over and over again in campaign appearances -- "strong and stable." But in the weeks leading up to the debate, her opponents labelled her weak and wobbly. She refused to do TV debates, flip-flopped on key policy points, and failed to engage the public in meaningful discussion on the topics of greatest interest, continually falling back on her "strong and stable" mantra. In the end, any coalition government May manages to pull together could be so weak that another national election is called -- possibly even this year. The results confounded those who said Labour's left-wing leader, Jeremy Corbyn, was electorally toxic. Written off by many pollsters, Labour surged in the final weeks of the campaign. It drew strong support from young people, who appeared to have turned out to vote in bigger-than-expected numbers. The overall turnout was 68.7 percent -- the highest since 1997. Corbyn called for May to quit, saying, "The Prime Minister called the election because she wanted a mandate. Well the mandate she's got is lost Conservative seats, lost votes, lost support and lost confidence. I would think that's enough, to go, actually, and make way for a government that will be truly representative of all of the people of this country." Speaking after being re-elected to his London seat, Corbyn said the election result means "politics has changed" and voters had rejected Conservative austerity. "The country needs a period of stability, and whatever the results are the Conservative Party will ensure we fulfil our duty in ensuring that stability," she said. "Clearly, if she's got a worse result than two years ago and is almost unable to form a government, then she, I doubt, will survive in the long term as Conservative Party leader," former Conservative Treasury chief George Osborne said on ITV.